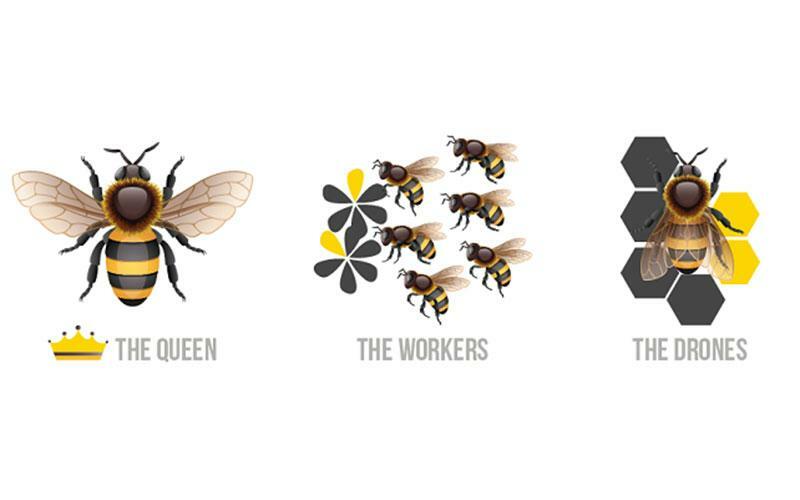 Honeybees are a highly fascinating, remarkably organized society. A bee colony is known as a super-organism as no single bee can survive on its own. There is division of labor and every bee must carry out their own duties and co-operate with one another for survival. Find out the roles and responsibilities of bees in a hive! The queen is the only fertile female in the colony. It is the only member that is able to lay fertilized eggs. The queen bee continually emits pheromones (a bee perfume) that only the bees in the hive can smell. These pheromones keep the female workers sterile and also act as a signal to assure all the bees in the colony that the queen is alive and all is well in the hive. The queen mates early in life, stores up millions of sperm within her body, and fertilizes her eggs as and when needed. She is capable of producing up to 2,000 eggs within a single day. To produce drones, she lays unfertilized eggs. A queen bee lives for 3- 5 years. However, when it falters in her egg-laying performance, the hive will start looking for a replacement and feed royal jelly to a developing larva. 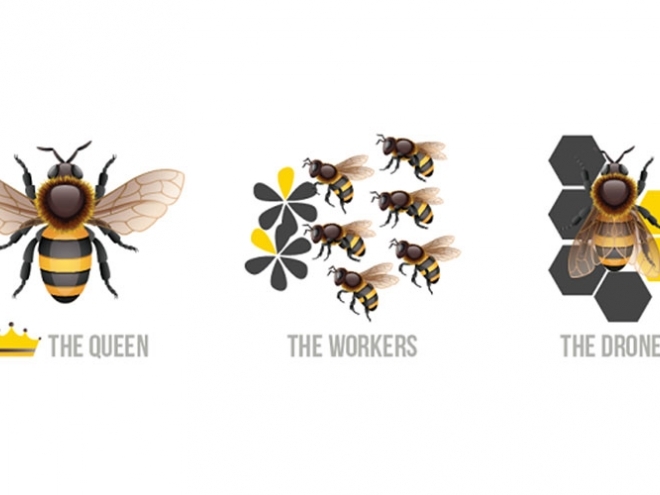 Drones, or male honey bees, have only one task: to fertilize new queens. Drones have neither stingers to help defend the hive nor the necessary body structure for collecting pollen or nectar to contribute and feed the community. Some honey bee colonies will eject surviving drones during fall when food for the colony becomes limited. Worker bees become cleaners of brood cells when they are only one or two days old. They are responsible for cleaning and polishing the empty cells that ready to receive new eggs and store nectar and pollen. The queen inspects the cells and if they are not clean, the cleaners will have to do it again. Brood care bees assume the role of incubating and caring for the developing larvae. It is said that on average, nurse bees check a single larva over a thousand times a day. Worker bees also take nectar and pollen and deposit into them cells as food for the colony. They feed pure royal jelly, a milky concentration secreted from the food glands in their heads, to the queen larva, and a mixture of pollen, honey and jelly to the worker and drone larvae. When a hive is infected with a parasite, the nurse bees selectively eat honey that has a high antibiotic activity and distribute it to other members of the colony. Worker bees that are about 12 days old are mature enough to begin secreting and producing beeswax, the material for the construction of comb. The wax flakes they produce help with the building of new wax comb and in the capping of ripened honey and cells containing developing pupae. The bee must consume large amounts of food (honey and nectar) to produce these wax flakes. Guarding the hive is the last task of a worker bee before venturing out to the fields. The guards inspect every bee that returns to the hive for a familiar scent. Only members of the hive are allowed to enter. The guard bee also looks out for any crack through which a robber bee or intruder might enter the hive. These worker bees also defend their colony against other insects. When they are about fourteen days old, the worker bees leave the nest at sunrise as foragers and visit the flowers four to five-kilometer radius from the hive in search of nectar, water, pollen and propolis. They can make about ten trips a day, each one lasting about an hour and return to their hive at sunset. At this final phase of life, at the age of 6 – 8 weeks, most worker bees will die in the field. As Charles Darwin put it, the honeycomb is a masterpiece of engineering and is “absolutely perfect in economizing labor and wax.” Do you agree?